Julie is an associate in the Columbia office of Clawson and Staubes, LLC. She was born and raised in Elizabethtown, Kentucky. Julie graduated from the University of Kentucky in 2012 with a Bachelor of Arts degree in politcal science. While in college, Julie was a member of Kappa Delta Sorority and served two terms as president of Tau Beta Sigma service sorority. She was an active member of the Wildcat Marching Band and Pep Band and served two years as the trumpet section leader. Julie attended the University of South Carolina School of Law and graduated with her Juris Doctor degree in 2015. In law school, she was a peer mentor and the Associate Symposium Editor of the South Carolina Journal of International Law and Business. She also spent two years in law school clerking for an insurance defense law firm. Julie was admitted to the South Carolina Bar in 2015 and to the Kentucky Bar in 2016. 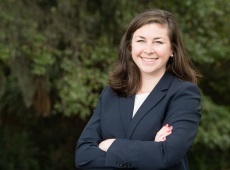 Before joining Clawson and Staubes, Julie was an Assistant Attorney General in Post-Conviction Relief at the South Carolina Attorney General's Office, where she handled hundreds of post-conviction relief hearings and appeals across the state. She has argued before the South Carolina Supreme Court and has been published in two Supreme Court opinions. Her practice areas now focus on civil litigation and insurance defense. In her free time, Julie enjoys cooking, traveling, reading, and gardening. She loves planning parties for family and friends and cheering on the Gamecocks and the Wildcats. Julie is a member of the Daughters of the American Revolution and the Junior League of Columbia. Mose v. State, 420 S.C. 500, 803 S.E.2d 718 (2017). Goss v. State, ___ S.C. ___, ___ S.E.2d ___ (citation not yet available) (2018).